I do my best to keep up with social media bits and pieces from my phone during the day while they are playing or distracted by Minecraft. The trouble is that I'm constantly on alert for an argument leading to a meltdown which requires me to intervene at short notice, so it's difficult to get on with longer tasks like writing blog posts. So when I do get a few hours of uninterrupted time to myself I need to have a plan, in particular a list of blog posts that I want to write to work through. So I thought I'd share some of the ways that I find blog post inspiration over the summer holidays! * Even though we don't always do a huge amount, we still do more as a family, and with the nicer weather we enjoy more day trips. So that usually gives me something to write about, whether it's a day out locally with friends or some activities that I've organised for the children at home. * Similarly, you can see what other people are talking about on Facebook or other parenting sites, in particular reactions to things in the news, and think about your own opinions or reactions. I generally have a continuous inner monologue going on anyway, and so I like to get things written down if I'm stewing on them, whether or not it ends up as a blog post. * I try to write down ideas as I think of them, and I have a Trello board where I store ideas for future posts. Some of them never see the light of day, but I go through them again from time to time and sometimes I see a way that I can take a different angle to an old idea, or I can combine several ideas into one. * It's also helpful to go through my old blog posts (this was enforced upon me recently thanks to Photobucket!) and I can see where I've written about the same sort of thing several times, which can be combined into a round up. This is particularly true when it comes to some of my crafty posts, for example my recent round up of Summer Hama bead ideas. * I spend a lot of time browsing Pinterest, both under my own account and also for the BritMums account. It's particularly good for crafting inspiration, as well as seeing what is popular and trending at the minute. Again it's important to credit any ideas that you reproduce, but I often find that it leads me on to my own ideas for crafts or things to try. * If I'm really stuck I'll search for lists of blog post ideas. There are loads of them out there, including a few that I've written myself - Blog post ideas for Travel Bloggers, Blog post ideas for Crafty Bloggers and Blog post ideas for Summer. This list from You Baby Me Mummy - 87 Awesome Post Ideas - also has plenty of ideas to get you going. 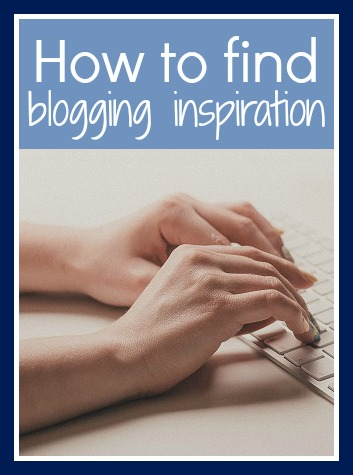 I very rarely take a blog post idea and use it exactly as the author intended, but they are great for coming up with ideas that you can adapt to your own blog and niche. I hope that this was a helpful post, and enjoy your summer! Great ideas. I find blogging over the summer easier then when my girls are at school. I have them home with me so have more to write about and we have 3 birthdays in the space of a month so that helps. That's true, I certainly have plenty of inspiration as we are out and about and doing things at home. Although finding the time to write about it all can be difficult!